ATLANTA, July 25, 2018 – Midweek matches mean fans start to see the top seeds take to the match courts and on Wednesday that meant Hyeon Chung, Ryan Harrison and John Isner were the focus of attention at the BB&T Atlanta Open in Midtown. No. 3 seed, Hyeon Chung defeated Taylor Fritz in two exciting sets, including a second set tiebreaker. Chung, who has been off the Tour for 10 weeks looked sharp in earning a break in the opening set and closing out the American on his serve. Chung earned another early break in the second set, but Fritz broke back as Chung appeared to lose his concentration. A refocused Chung forced a tiebreaker and he earned a quick mini-break before defeating the big serving American, 6-4, 7-6 (5). The 2017 BB&T Atlanta Open finalist, Ryan Harrison, defeated Slovak Lukáš Lacko in three sets, 2-6, 6-2, 6-3. Harrison got off to his second slow start of the tournament, before finding his range with his forehand and improving his first serve percentage. Harrison was one racket down in the third game of the first set, but sometimes an outburst like that can help, and with Harrison it paid dividends as soon as the first set ended. Once Harrison calmed down and found his confidence, you could see him pick up the pace and take the match. Harrison will move on to play Chung in the quarterfinals. Australian Alex de Minaur attempted a bold strategy against John Isner’s trademarked serve Wednesday night at the BB&T Open in Atlantic Station. By standing on the service line, de Minaur looked as if he wanted to surprise the big server by taking his sometimes 140mph serves early. Unfortunately for the Australian, he only reached a single breakpoint on the No. 8 player in the world. Isner took the first break of the match by fighting of a game point at 3-2 to make the score 4-2 in the first set. deMinaur had a slight chance by earning a breakpoint in the following game but the opportunity was eliminated by a huge Isner serve. At 5-2, the 6’10” veteran stopped play to challenge a ball hoping to break de Minaur and clinch the first set. However, the ball clipped the baseline and the Australian survived. Isner eventually redeemed himself by challenging another line call in the following game to win the first set 6-3. The second set was uneventful with Isner overpowering the 19-year-old to break his serve in the opening game. Serving once again at 2-4, de Minaur double faulted on break point to basically ensure the match to the American. 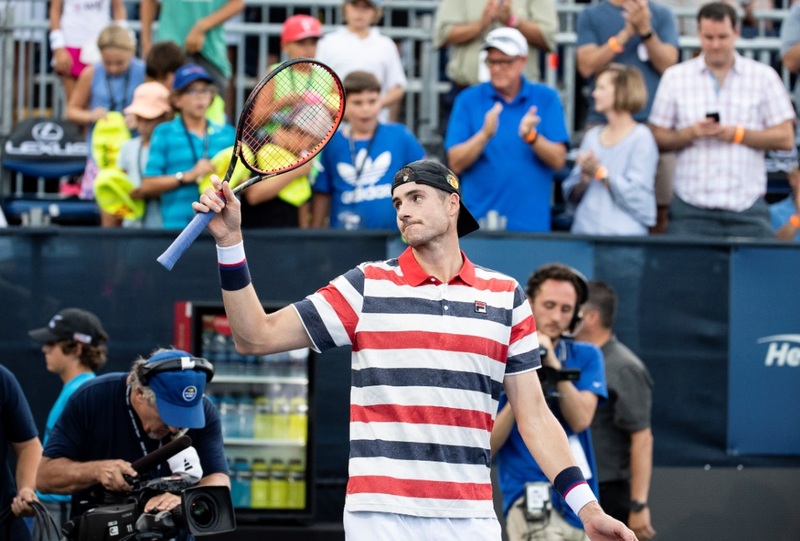 Four big serves later, Isner had earned a spot into the quarterfinals on Friday against Mischa Zverev, with a 6-3, 6-2 victory. At the USTA Georgia booth for Special Pops Tennis, an eight-year old Atlanta native, Rocko, set the bar high for his first pro tournament experience by getting an autograph from the number two seed, Nick Kyrgios. Fans at the BB&T Atlanta Open got in line today at the Special Pops Tennis tent to receive an autograph and meet Kyrgios. “He signed my wristband so that was pretty cool,” said Rocko. Kyrgios plays his first match tomorrow against Noah Rubin of the United States. Main draw singles and doubles play continues Thursday!